Posted By:Unknown | At:10:09 PM Be the first to comment! 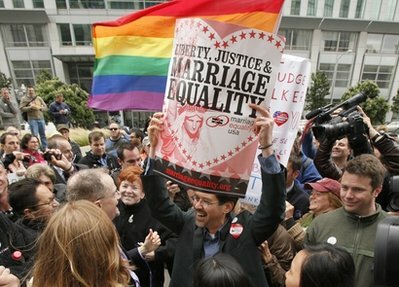 A federal judge today overturned California’s ban on gay marriage, saying the voter-approved initiative violates both the due-process and equal-protection clauses of the U.S. Constitution’s 14th Amendment. Yahoo! News will be here in Los Angeles, tweeting the latest news and offering first-person reactions to this landmark ruling. U.S. District Judge Vaughn Walker's ruling does not make gay marriage legal in California immediately. The effect of the decision is on hold while Walker decides whether it should be suspended as defendants appeal the case to the 9th U.S. Circuit Court of Appeals. In January and June, Walker heard from both sides in a unique proceeding intended to make factual findings on the purpose and history of marriage and how allowing gays and lesbians to marry would affect society. Befitting a trial on one of the most contentious issues of our time, the affair featured high-powered lawyers, emotional testimony both for and against gay marriage, arguments over evidence and over cameras in the courtroom, and extremely high stakes: Regardless of today’s outcome, the case is likely to be appealed all the way to the Supreme Court. The Prop. 8 trial has been unique in its execution and scope; the judge truly looked for a factual record on marriage. Theodore Olson and David Boies — the lawyers who opposed each other before the Supreme Court in 2000 in Bush v. Gore — teamed up to argue on behalf of four homosexual plaintiffs that Prop. 8 violates the rights of gays and lesbians under what's called the equal protection clause of the U.S. Constitution. The defendants argued that the traditional definition of marriage should be maintained and that it's in society's best interest for children to be raised in heterosexual households. Gay marriage is now legal in five states — Connecticut, Iowa, Massachusetts, New Hampshire and Vermont — and the District of Columbia. Last month, a federal judge in Massachusetts declared that parts of the federal Defense of Marriage Act violated the Constitution.